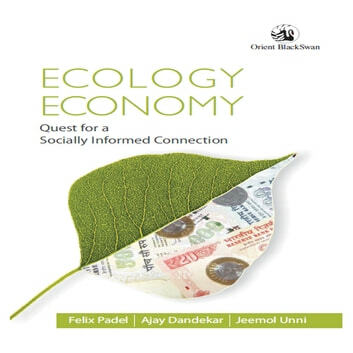 Ecology, Economy is an elaborate argument to establish society as central in policy-making for holistic development. The book presents cases of the adverse effects of resource utilisation—water, metals, power, land—on Adivasi communities in particular. It presents an overview of the paradoxes inherent in ‘development’ projects, emphasising the drastic drop in the standard of living of rural communities, and the immeasurable damage to India’s ecosystems and resource base.The authors highlight the tussle between real growth and the rule of law, the informalisation of labour under a neoliberal economy, and current threats to ‘Adivasi Economics’—the little monetised systems based on a long-term symbiosis with the natural environment, based on taking from the ecosystem without intrinsically damaging it.It asks: what is real development? How can we transform present developmental patterns to achieve a more truly sustainable path towards collective well-being? Is there any politically feasible path out of the multidimensional economic, environmental, social and climate change cataclysms facing us now in India and worldwide? Contrary to seeing dissent as ‘anti-development’, this book puts a face to the people on whom ‘development’ is imposed.A product of the confluence of anthropology, policy analysis and rural economics, this volume also comes with an extensive Bibliography to lead researchers and every interested reader towards a rich body of work. It will be useful for students and scholars of sociology, economics, anthropology, ecology and environmental studies, development studies, political science, law and international affairs.